Arriving in La Paz in the middle of a rainstorm I was reunited with BF and waved goodbye to M for a week or so. 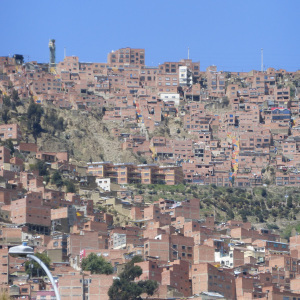 Plenty of cities look similar to each other but the geographical appearance of La Paz must be unique. Picture a paper cone – the sort that chips come in now that the Health and Safety mob have declared it to be unsafe to eat your fish and chips out of newspaper. Rotate the cone so that the small bit is at the bottom. Now imagine that the cone is the size of a city – a city that can contain a million inhabitants. Fill every single space on the side of the cone with buildings – tall, crooked and for the most part (a tax avoidance scheme) unfinished. Have old dilapidated buses crawl up and down the impossibly steep streets, struggling to navigate the tight corners and which belch out exhaust fumes that smother everything in a coughing grey dust and then have a thin veil of cloud/smog/fog hover over the top of the cone trapping inside all of the pollution and noise. 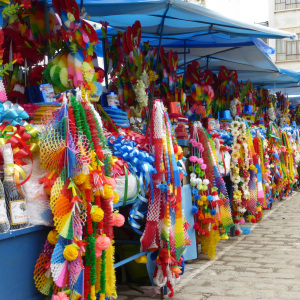 This is what La Paz is like. At the top of the cone on the massive, flat, goes on for miles alto-plano imagine another million inhabitants, then open up one or two major highways that hairpin up and down and sit back and watch the gridlock as huge numbers in both cities travel between each other like columns of black ants scurrying up and down the mountain side. And for good measure chuck in a couple of political protests which close roads for hours at a time or set up a street market on the main highway. If cars and buses have to use the roads lets not make it easy for them! 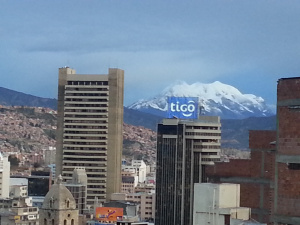 I actually felt quite claustrophobic for much of my time in La Paz – eased only when the smog lid lifted and the most amazing snow capped mountain shimmered into view. Our hotel was in the area known as the Witch’s Market where you could buy spells, tokens and amulets, all kinds of dead looking herbs and grasses and llama foetuses. The latter were to be bought whenever a new build was considered and four would be placed – one under each corner of the foundations. to bring luck to the property and to appease the gods. 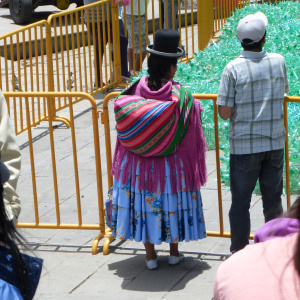 Here in Bolivia the vast majority of women wear multi-layered skirts and oversized bowler hats (covered with a plastic bag if rain threatens), all in a riot of unmatching clashing colours. Beggars are far more prolific here than anywhere that I have been in Peru and tiny babies swaddled in rags lie still, plonked on pavements alongside parents selling street food, newspapers or spells. I should mention here briefly our border crossing into Bolivia at Desaguadero which my Lonely Planet Guide recommended we avoid. This town was horrible. It was jam-packed with queues and chaos all snaking slowly to or from the river which formed the border crossing. We queued for an hour to get an exit stamp from a surly Peruvian official, walked the three hundred metres across the bridge with a tide of handcarts, porters, people and buses jostling and shoving and then joined another queue to get an entrance stamp and visa from a just as surly Bolivian guard. The chaos was so great we actually lost six people from our coach, or at least the driver decided he had to get home for his dinner and left without them, but with their luggage still on board! I was so glad that I was with M and not on my own. It looked like one of those scenes on the Nine o’Clock News when refugees rush a border bridge and I was actually quite nervous, but we did finally get through it all to the relative safety of La Paz. Following the advice of guidebooks and people that we met in La Paz me and BF decided not to risk riding down the Coroico – the Death Road on mountain bikes – but only because it was the rainy season. I would like to think that on my way back through Bolivia I may give it a go – although my fear is not of the cycle ride itself but of the possibility of having to ride some of the terrifying road in a transport vehicle. We watched them loading the vehicles with bikes, spinal boards and stretchers as well as mountain rescue gear for the occasional adrenaline junkie who pushes adventure a bit too far, so if I am going to do it then I will at least reduce the risk and go in the dry season. If you are interested in knowing more about the amazing life style that went on inside San Pedro, I suggest that you read the excellent book Marching Powder by Rusty Young which I ordered on my Kindle after our tour. 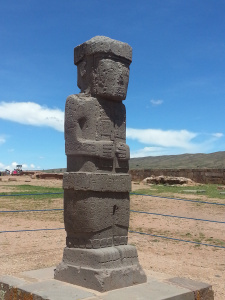 Instead of risking Death Road we chose to take a day trip to Tiwanaku. I didn’t expect too much having never heard of it but it was actually a real gem. 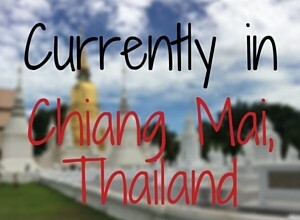 It is set on a remote part of the alto plano and to get to it we had yet another crazy journey. Our driver got fed up of sitting in a taxi jam, pulled through a gap in the central reservation and continued down the main road in the fast lane of the opposing traffic with all of us in the minibus stunned into shocked silence as oncoming cars veered around us!!!! A police officer flagged us down then to our amazement walked along in front of the bus indicating that traffic should get out of our way. He didn’t seem at all concerned that we were on the wrong carriageway, just that we should reduce our speed to walking speed. Arriving at Tiwanaku and grateful to be in one piece we learnt that the site was the cradle of civilisation in Bolivia. It is currently being excavated and courtyards, gates, strange stone statues, pyramids and stone carved faces purported to be of aliens are being uncovered regularly. The importance of the site has only recently been recognised and the biggest and best statue returned to the safety of the museum. It used to stand outside the main football stadium where it had bullets holes shot at it and part of its nose was hacked off by a policeman. I was actually quite glad to leave La Paz although our final experience on the road out was one which I could have gladly missed too. We drove past a traffic accident on the steep hill, and past three very dead people who had been caught up in it. The police were trying to clear the wreckage and had just laid two of the bodies uncovered on the road whilst the third was still sat, very dead, in his car. 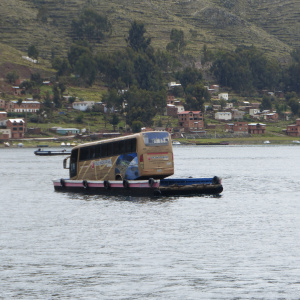 It was a relief to get out of the coach and board the little motor boat which took us over a narrow bit of Lake Titicaca whilst the bus got loaded onto a floating pontoon and was brought across separately. Bundling down the hillside we arrived in the cute little lakeside town of Copacabana. Here we had a beautiful looking hotel but this was most definitely a case of looks being misleading. It had the worst service of any hotel I have been in so far, the breakfast was very grudgingly served and the room not once cleaned but its redeeming feature was the outstanding view out over the lake. 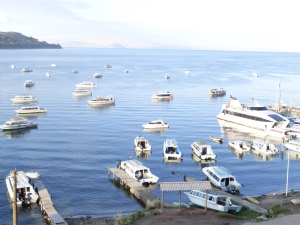 I adored Copacabana although I never made it on my planned trip to the Isla del Sol as I was floored with altitude sickness. It was odd as I had been fine in La Paz but of course there I had been at the base of the bowl rather than an extra couple of hundred meters up on the alto plano. I felt nauseous, I had a thumping headache, it hurt to walk and I felt as if my heart and lungs were being squeezed, so after drinking my body weight in coca tea (which did work but was very short lived) and turning my tongue green chewing coca leaves I finally visited the pharmacist for his magic bullets and I took to my bed until I acclimatised. New Year’s Eve was spent in a rather bizarre bar/restaurant chatting to a Chilean stand-up comedienne and her husband a copywrite lawyer, until midnight when we all piled out into the main street. Copacabana has one main street which rolls down to the beach and it seemed everybody was out there. Fireworks were set off, and rather worryingly, too many by children who may have been five or six years old and who balanced massive powerful rockets in holes in the pavement prior to their launch. We all danced to a line of drummers who bongoed their way up the street whilst keeping one eye on the rockets, poised to dive for cover if one skittered into the crowds and the other on the children who were now throwing strings of firecrackers at our feet. On New Year’s Day we wandered into the main church for a quick peek. They were just preparing for a service and we were slightly perplexed that people were taking their dogs in and bundles of flowers. We left when it became standing room only but at least we found an explanation for the flowers. 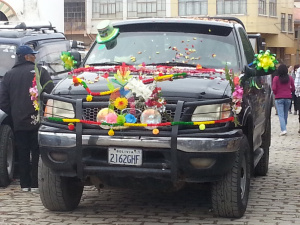 Outside was a car blessing ceremony in which cars and vans were decorated lavishly with flowers, shiny plastic top hats, confetti and even dolls. And then a priest in his long brown robes carrying a blue plastic bucket walked through the crowds sprinkling holy water whilst the owners, not trusting in him and his God entirely, poured the contents of beer cans over each of their vehicle tyres. 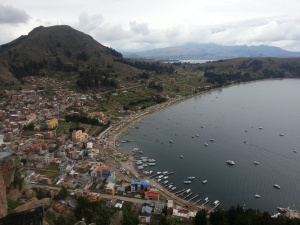 As the cars drove out of the square and began to cruise around the small town we climbed to the top of the nearby hill. It is a pilgrimage route marked out by fourteen large stone crosses with many more crosses and alters at the summit. 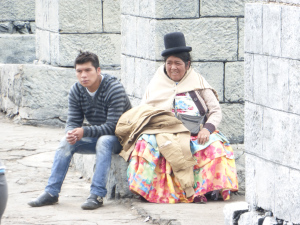 On an ordinary day we would have probably been two of a handful of tourist panting up to the top but on this holiday when many extra Bolivians were in town we witnessed some interesting sights as the hill was used for its original purpose. People paused to pray at each cross whilst on the stone alters far older ceremonies were performed with shamans muttering prayers over burning herbs and items. We saw a man melting silver in a little cauldron over a fire and then believers ladled a spoonful of silver into a pot of cold water. The shaman fished out the solidified lumps of silver and for a fee ‘read’ the shapes which had been formed. 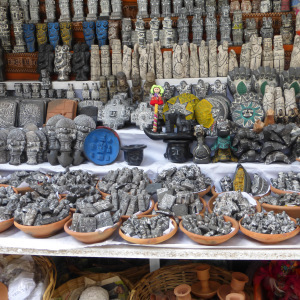 Extended families picnicked in little nooks and crannies and countless stalls sold the miniature items which people could buy, get blessed and then burn for an offering to their gods. 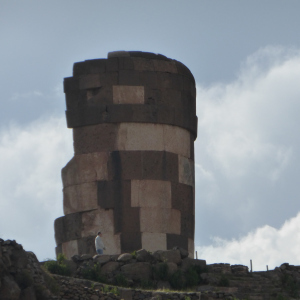 This mystical site is where the VIP’s of the pre-Incan world were buried inside large funerary chimneys. Many of these chimneys remain, their tall forms silhouetted against the sky reminding me of the chimneys of the tin mines on the moors in the UK. As I have already recommended one book in this post I shall unashamedly side track here to recommend a brilliant book by my friend and author Terri Nixon. I felt a similar energy at Sillustani to that which Terri portrays so well in her book the Dust of Ancients. Read it, and feel the magic. You won’t be disappointed. Sillustani was another occasion where the location of a site justified its existence. 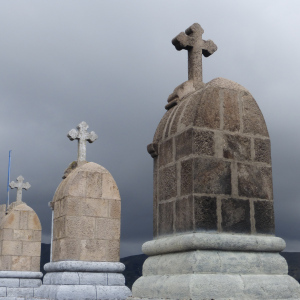 Set on a breezy lump of land overlooking Lake Titicaca with vultures wheeling overhead and the strong wind coming off the water it was easy to see why they chose this as a resting place for the priests. Our trip home took us via a little small holding to see how a family live with their guinea pigs (food), alpacas, llamas and open fires. I did feel a bit uncomfortable to be poking around in their backyard but it was very interesting. And I can confirm that llamas do spit. With amazing accuracy. Later that evening back in Puno I had a very interesting night out with a trainee pharmacist from India who I had met on our trip to Sillustani. We shared dishes of guinea pig and cebiche. A lot has been said about guinea pig but apart from the faff of trying to pick through the tiny bones, it was actually really quite delicious. Thank you R for walking me home although I still feel a bit bad that just as you turned to walk back to your hostel there was a thunderclap and the heavens opened. You must have got soaked to the skin. I eventually met up with M again who had been off on her own mini adventure visiting the islands on the lake and we caught a plane back to Lima from Juliaca and then took our final night bus of the trip to Lima – ready to launch ourselves back into work the following week. Hiya, my goodness there was a lot in that one and I always read your posts without the pics then look at the pics to see if the description you give matches the one you give me in my head, they do – tada!!! I would’ve soooo loved to have mooched around Tiwanaku, the mystery there I think is that they still haven’t totally deciphered the glyphs and I would love to have a go! Oh my goodness I see just what you mean about the landscape at Sillustani, it’s soooo like the Cornish Moors and I can imagine all the characters in Terri’s book wandering around there cursing in Spanish ha ha!!! 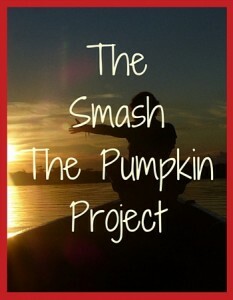 Well what an epic post to get an honourable mention in, thank you! Fantastic descriptions, as always, how weird to learn they have to pay an entrance fee AND rent their own jail cells! Brilliant, brilliant, brilliant – I could almost smell the place, could certainly hear it! ps – leave the guinea pigs alone! !